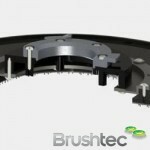 Find out more about the flex drive pad holders from Brushtec. 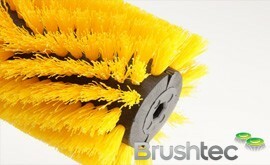 The future of brushes for floor cleaning machines depends on continuous innovation and development. Brushtec has always risen to the challenging demands of the floor cleaning machine industry and the impressive flexible drive system offers many desirable advantages over standard pad drive designs. This unique dynamic energy absorption drive ring uses specially formulated elastomer polymers designed for continuous flexing and durability. 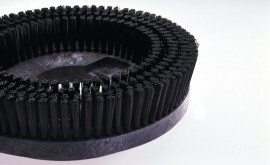 Tests on our flex drive pad holders were performed by major European manufacturers on both high- and low-speed machines. Results highlighted a significant improvement in shock control, vibration and noise. Because machines vary in weights and speeds, we offer several levels of ring diameter and stiffness. The black ring has proven most popular and is ideal for the widest range of machines and working conditions. When used in conjunction with a pad drive, the flex system eliminates the need for foam backing, which is more expensive to manufacture and is liable to wear and can de-laminate in service. Please contact us if you’d like to speak with an expert about our flex-drive pad holders. You may also like to check out our flexible disk drive section.